I just noticed you have some mini mud guards in back of your front wheels. Would you perhaps think of moving them in front of the wheels ? I'm a little worried that you are going to screw up your paint job with that tape. Does it come off easily ? Those are stock mud guards and so it would be hard to move them. I have not noticed any residue on the paint when pulling off the tape. It is "transparent" 3M duct tape, btw. Yes, that's exactly what I did -- I didn't fill it all in, but I smoothed it out and "increased the radius". I didn't put the tape into the visible glass; just over the blacked out edge -- and I didn't cover the VIN or the inspection sticker. Neil, I like your go-get'em style. Any plans for the wipers or mirrors? There is some intrigue in your idea for the structural storage undertray. I am looking at a tray for my truck but hadn't thought about that. I didn't see much improvement on my grill block but that could be for many reasons. One questions I have is this, is it better to block the upper grill or lower grill? I have a Subaru Outback with the lower grill blocked and the upper grill open. I chose to do the lower one cause it was a bigger opening but it may be at the stagnant point anyhow so the blocking the upper grill may be better for smoothing flow over the hood. any thoughts? On an Outback Sport I didn't get any noticeable mpg difference with the lower grill blocked, but it also didn't hurt the cooling. Haven't tried the upper. I figure any air was going under the car instead of through the grill and under. With an undertray it may make a bigger difference. Try tucking in your mirrors. And yes, I would love to try some video cameras and inside LCD screens for the side view mirrors (a la Aptera), or add some fairing to the existing mirrors. A clear plastic "pyramid" on the trailing side (so I can still see through it); and/or a leading face cone, would let me keep the existing mirrors intact. But if video cameras can work in the dark and in low visibility situations (fog, snow), then I think that is the better way to go. I doubt that their electrical use is very significant -- certainly much less than the stereo, and way more than enough to offset the aero gains. They already make backup cameras -- what company will make side view cameras with some 7-9 inch LCD screens? And yes, I would love to be able to have a body shop weld in a new floor to the hatch area -- the spare and jack could be put lower down and the volume of the storage would about double AND the aerodynamics of the rear would be greatly improved. I might have to wait until my 100K warranty expires before I attempt anything like this, though. Last edited by NeilBlanchard; 06-19-2008 at 06:39 AM.. Check out http://www.bluedevilproducts.com/Hom...20Frameset.htm for cameras. I'm sure there are others out there, too. but by looking at the steepness of the windshield, aero mods like this would be futile! However, I was wondering how your tape does under all that heat from the engine? 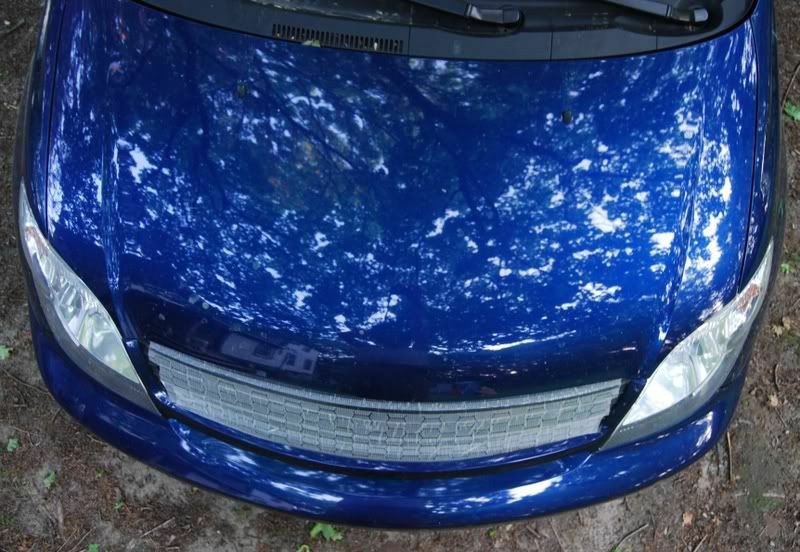 Or could I cover a bit of my lower grill without worrying about it melting or sticking to the plastic grill? Last edited by Z man; 06-23-2008 at 02:46 AM.. The tape doesn't melt -- the heat goes back, so the tape really doesn't get very hot. BTW, I've taken the tape up onto the hood off, and replaced it with a foam gasket to seal out the air (so I can open my hood again!). I had called my local Toyota dealer about getting a proper rubber gasket (like the Camry and the Prius have), but they don't sell it as a separate item. I also got some 1/8" "Plexiglass" to make proper covers for the fog lights -- I'm going to mark the oval onto the tape, and then stick the tape on the Plexiglass, and cut it out so it fits flush. I'll probably use tap to hold it on, but at least I'll be able to use the lights. I'm contemplating how one would use something to decrease the drag at the back of my xA (or any hatchback\stationwagon)? Ditto for improving the stock mirrors? Cool. Been thinking about some mods to my xA and was worried about covering the grille. I'll get a SGII to doublecheck on potential overheating. In California, the summer heat is unforgiveable (100-103 is the norm as of late) here but I like what I'm hearing on the gains.